July 15, 2016 By Chelsey Leave a Comment This post may contain affiliate links. Read my disclosure policy here. You may be wondering, What is a smash cake? 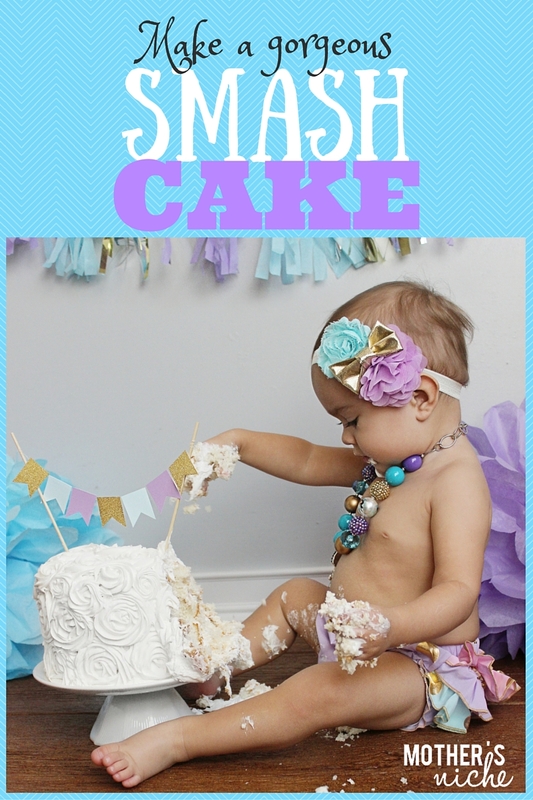 A smash cake is a small frosted cake used for a first birthday celebration or for a first birthday photo session. 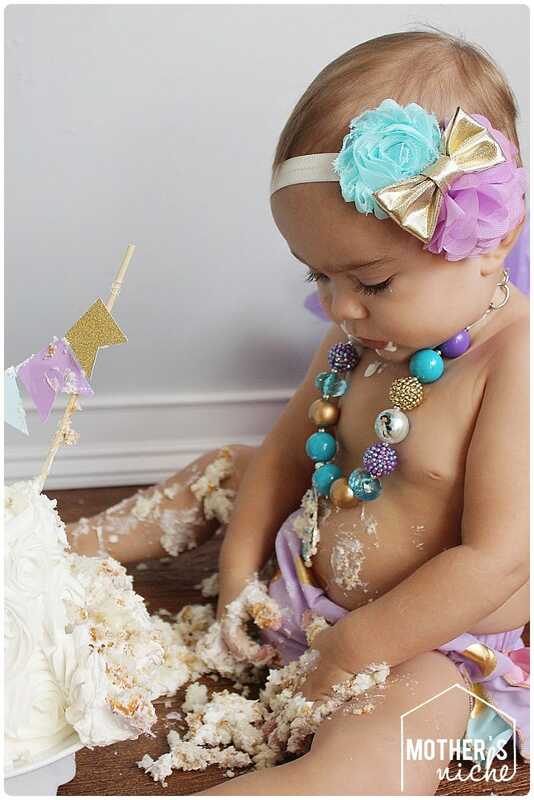 Basically, your little one destroys the cake and makes a huge mess, while you get memorable pictures of their first taste of cake! So much fun! But in reality you can use this tutorial to make a cake for any occasion. 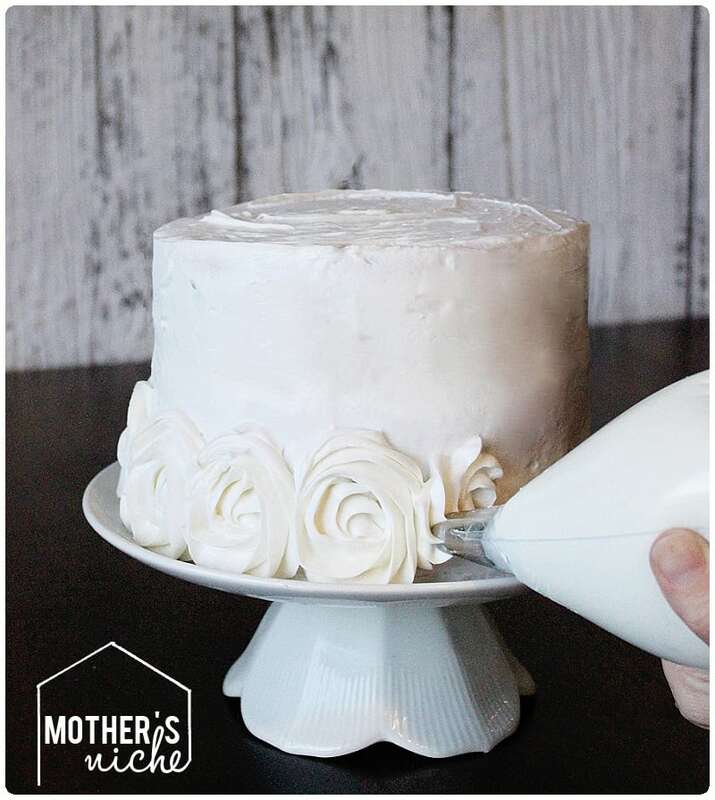 This cake tutorial uses frosting roses, which makes it girly, but for a boy cake you can simplify and follow through step 3. Cake mix of your choice (usually need just one box but for 3 layered cake mix two) and additional ingredients for making the cake batter – eggs, oil, etc. 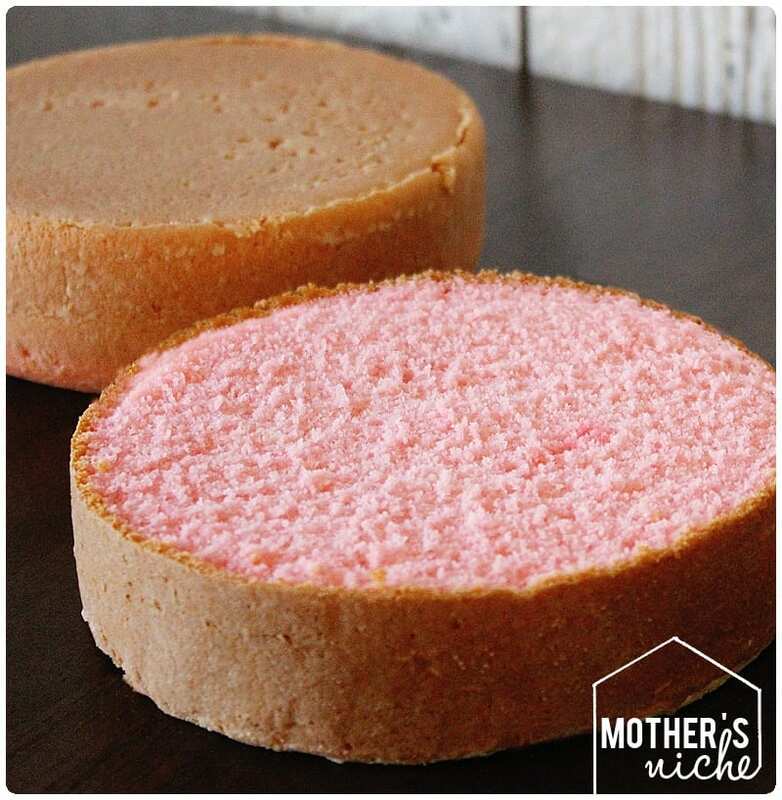 *IF you are a baker and are familiar with the use of cake pans, then you are a super-duper expert and can skip to step 2. Step 1- Preheat oven as directed on cake mix box. Then, get mixing your cake mix with required ingredients in your mixer. Meanwhile, grease and flour your pan. I usually coat my pan with shortening, then dust with flour, dumping excess. Fill pan 2/3 full of mix. Bake for 25-30 minutes. Remove from pan and let cool. *Helpful hint: Make sure it is fully cooked and golden on the top. Poke it with a toothpick – if it comes out clean, it’s done. If it’s not clean, bake a few minutes longer and check again. Repeat until it pick comes out clean. 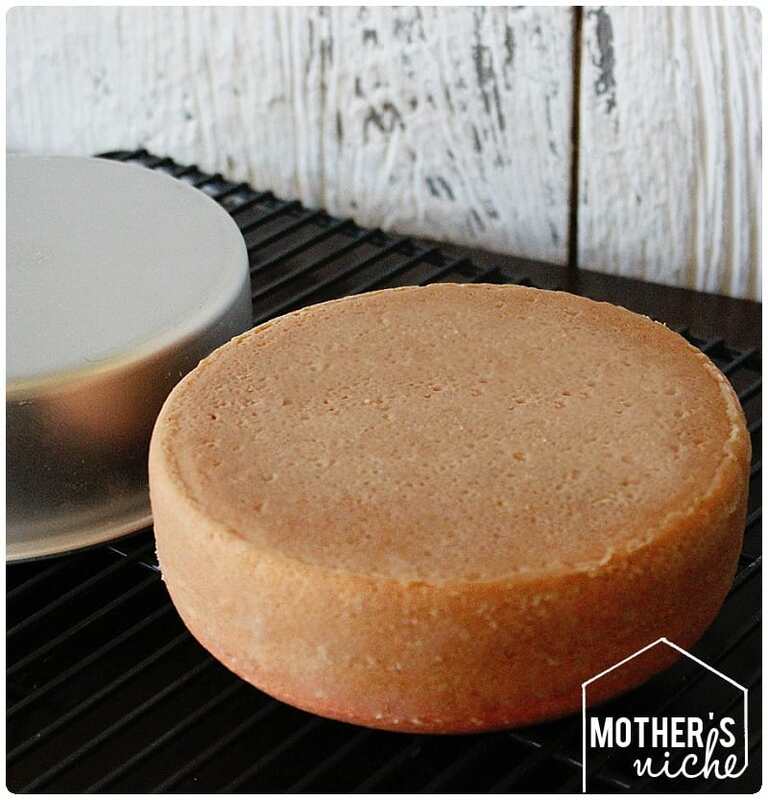 When cake is fully baked, remove from oven and remove from pan within the first 5 min. To do this without the cake sticking to the pan, quickly swish the pan from side to side and you will see that the cake is loosening from the pan. When all edges are freely pulling away from the pan you can carefully flip the cake over onto a cooling rack. Repeat Step 1 two or three times making the desired number of layers for your cake. I like the tall look so I usually do three layers. If you have more than one of the same size of pan, speed up the process by baking more than one cake at a time. In case you are wondering, patchwork is okay and this cake will be completely covered with frosting and will later be destroyed by an infant, so No Worries! Step 2- When the cakes are cooled completely. Level that cake using a large knife. I use a bread knife to cut off the cake top (or muffin top). Start high on the top and take off a little at a time until the top is level. Once all your layers are level, get ready to put them on a cake plate (or even dinner plate). 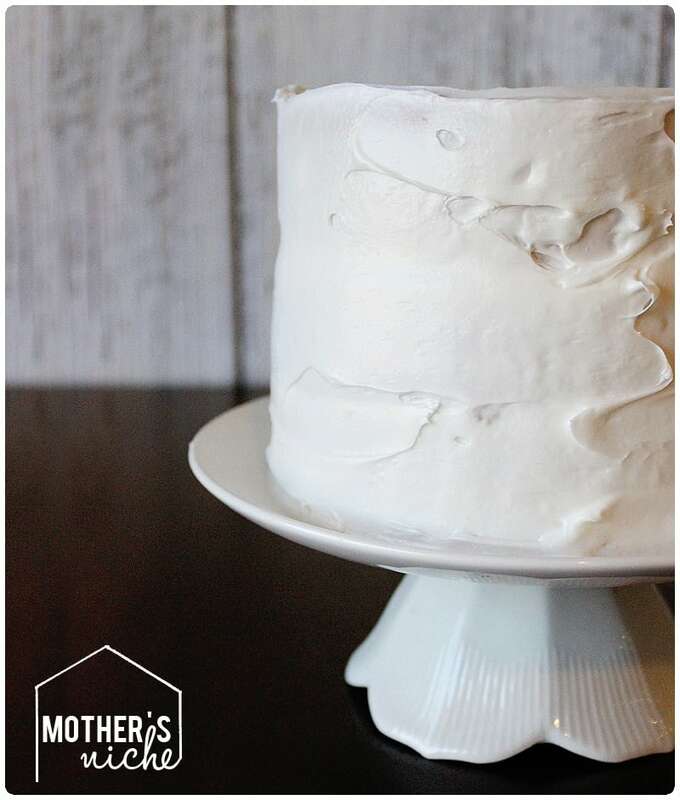 Before layering, put a dollop of frosting on the plate to hold your foam board in place. 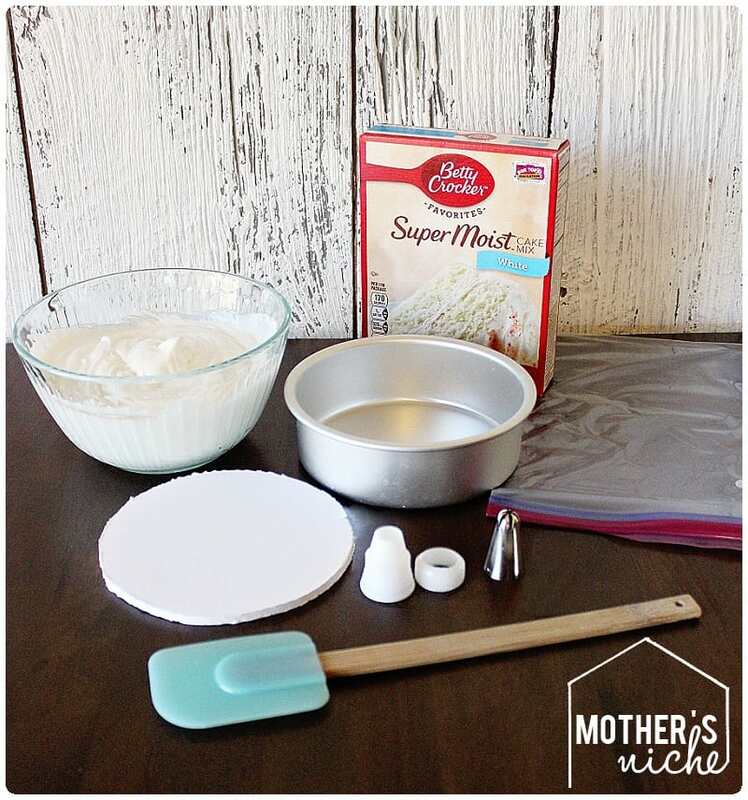 The foam board is handy for easily removing the cake from the cake plate to store any leftovers you might want to save. Add first layer to the foam, generously cover with frosting, then 2 second layer, frosting, then third (if you have one). Step 3- Now you are going to frost the whole cake. Perfection is NOT required. Just slop it on and then smooth it out with a butter knife or spatula. Don’t make the layer very thick. If it is too thick your frosting roses will slide off. 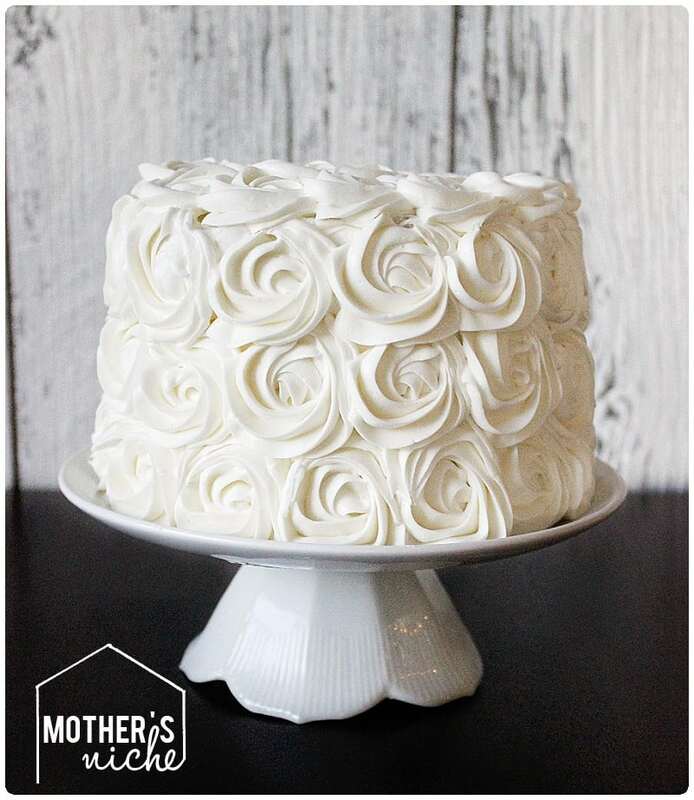 This layer of frosting is to hold your roses in place and hide the cake. ~IF you are making this cake for a boy, you can stop at this step. 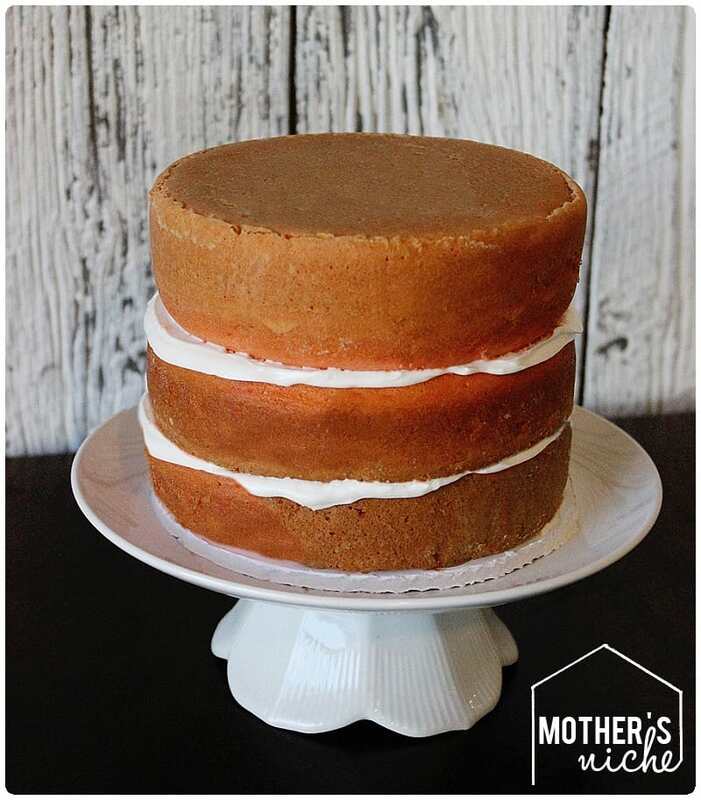 Just finish your cake by making your layer of frosting a little thicker, then smooth nicely. 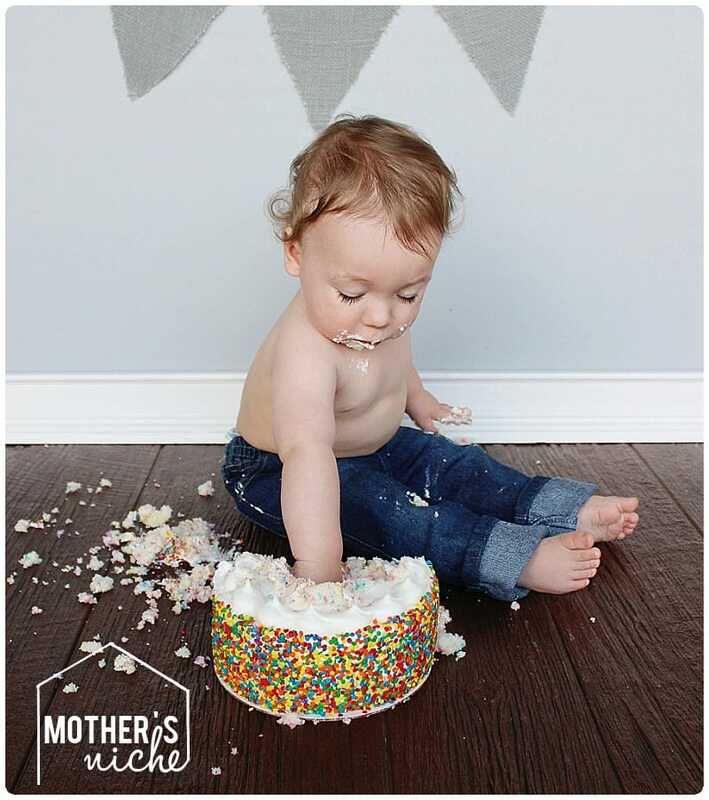 Then cover the top or sides with colored sprinkles and you’re done with your little boy’s smash cake! Step 4- Fill your zipper bag and cut a small piece off the tip. When I say small, I mean a ¼ inch. From the inside of the bag push your coupler in place through the hole. The bag should not cover the opening of the coupler. If the whole is too small, cut it a bit more and try again until the coupler fits correctly. Place tip on the outside of the bag and secure with the ring. If you have a large tip without a coupler, place the tip into the hole in the bag. Make sure the tip is inserted through the hole about half way. I like to secure it in place with a small piece of clear tape. Then, fill the bag with THICK frosting. To test the frosting before filling the bag put a small dollop on your hand and make a point on top (like an ice cream cone). Flip your hand upside down and then upright a couple of times. If the frosting kept its shape then it is ready to go. If not, add powdered sugar to it until it thickens and passes the test. 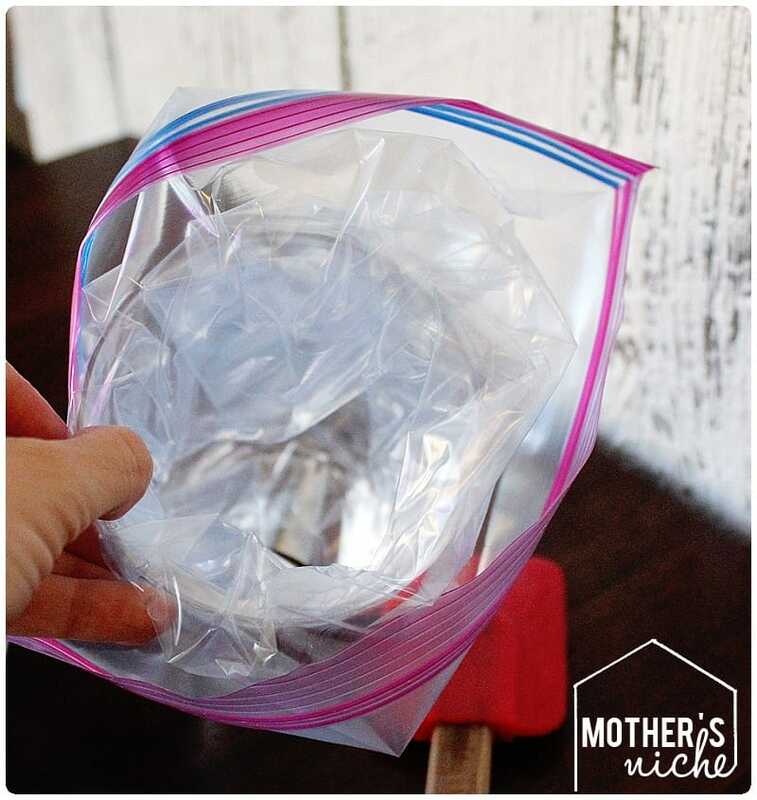 *Helpful hint: To fill the bag easily and without mess, place the bag tip first into a large empty glass. Fold the top of the bag over the sides creating a funnel. Then fill. Remove air, zip, then twist the ends of the bag to push the frosting to the tip of the bag. Step 5- Time to make the roses. Make some test roses to practice. 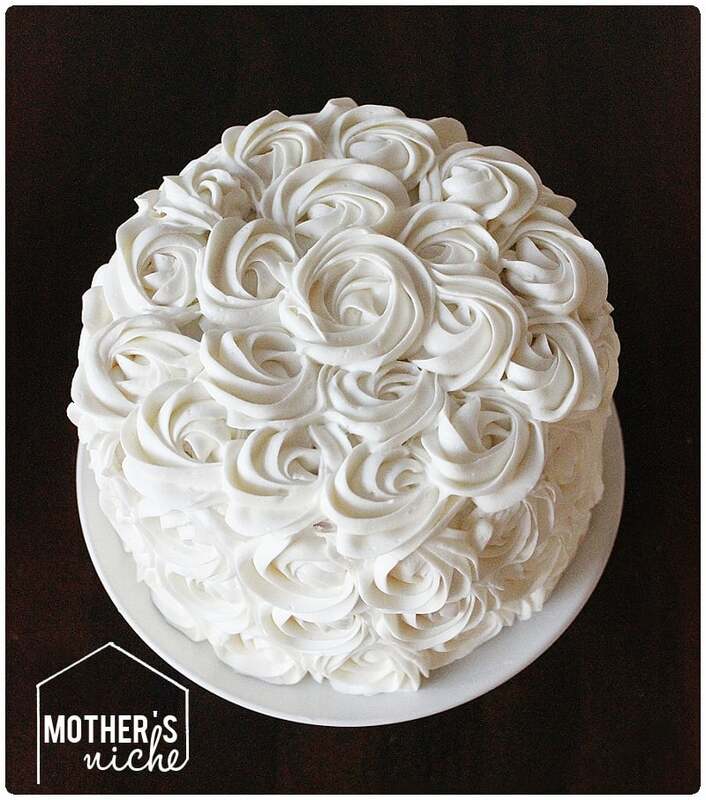 I make my rose starting in the middle and swirling counter-clockwise squeezing the frosting bag as you go. When you get to the end of your swirl, stop squeezing and gently pull away. It takes practice, so make as many as you need. Hold the bag in the same position as you swirl. When you are confident and ready to begin, start at the bottom layer of the cake. *Helpful hint – If at any time you notice that some of your most recent roses are not holding your shape it may be due to the frosting warming up in your hands. Stick in the fridge for 5-10 minutes and continue. 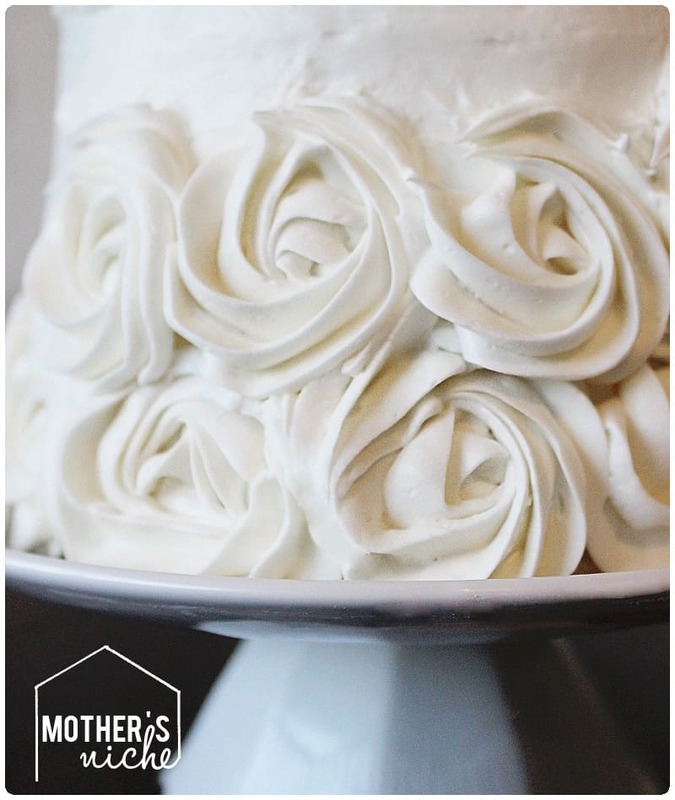 Start your rose ½ inch up from the bottom of the cake. You will make one complete swirl around your center point. Start your next rose ½ inch from the last rose and ½ inch from the bottom. Continue until you complete your first layer of roses. Use the same technique and spacing with the second and/or third layer. But this time, offset your roses so they are not directly above one another as shown in this picture. On the top of the cake, start on the outside and make your way in. Finish your last rose in the very center. DONE! Take it easy on yourself. 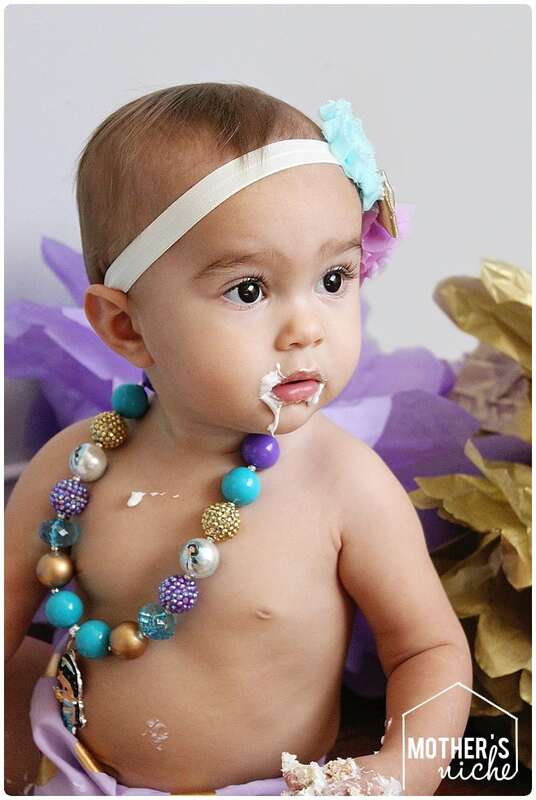 And if you are indeed making this for a smash cake it WILL be smashed and mushed all over your baby’s face in a matter of seconds and you won’t care how it looks. 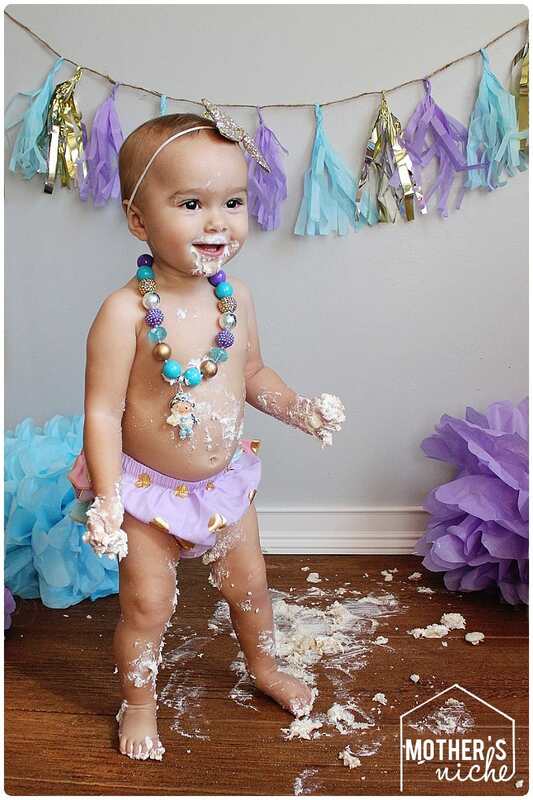 WORST CASE SCENARIO – More than once I have decorated a cake and didn’t like how it looked. 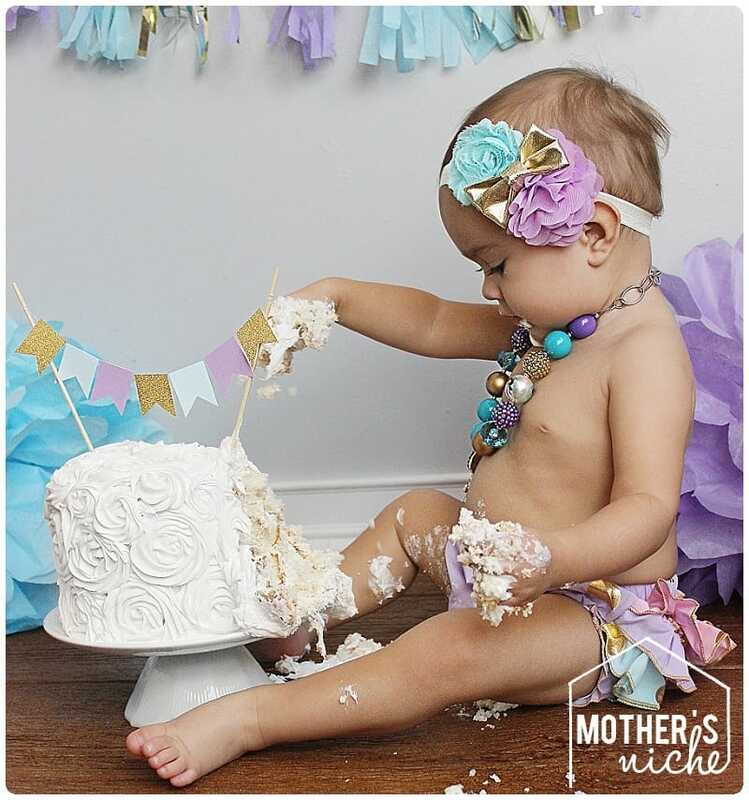 Well the beauty of frosting is you can always gently scrape off the roses and start over. I have done this multiple times and frosting is very forgiving. Just avoid touching the actual cake when frosting it and repeat Steps 4 and 5. 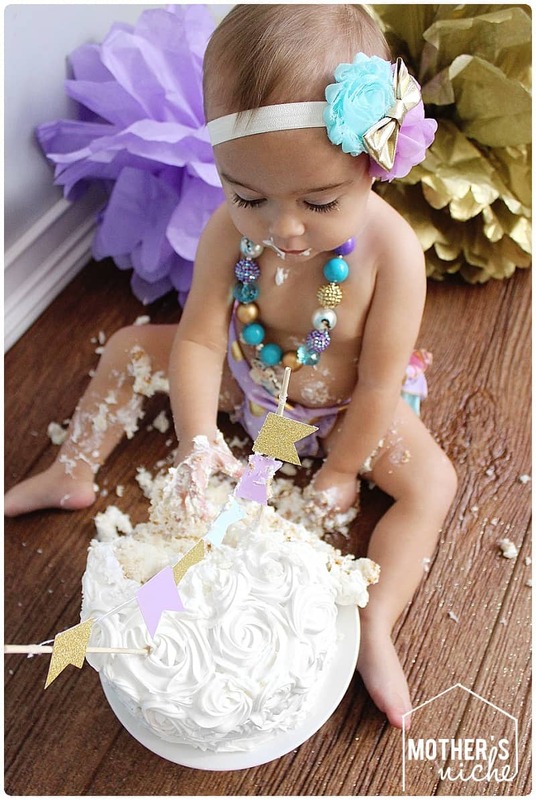 What suggestions do YOU have for making a Birthday Smash Cake? « 3 Tips to Lose Pregnancy Weight and Get Your Body Back!